Some men grow a beard and it comes in thick and full as if they were always meant to have one. Others struggle to grow a beard that doesn't look patchy because of bare spots and other issues. For the unfortunate latter group of men, the reasons for uneven or non-existent beard growth are many – from genetics to stress to alopecia areata to hormone imbalances. But, no matter the reason, men who are thwarted in their mission to attain full-bearded glory may lose hope. The fact is, there are many methods to fix a patchy or sparsely-growing beard, including beard transplants. Indeed, a beard transplant is similar to a hair transplant on your scalp and strives to achieve the same desired effect – a full, natural-looking beard in whatever beard style a man chooses. In this post, we're going to take a closer look at beard transplants, including how they work, their effectiveness, and even what the future holds. We'll also look at other ways to fix a patchy beard, but our focus is on beard transplants. So, What is a Beard Transplant? 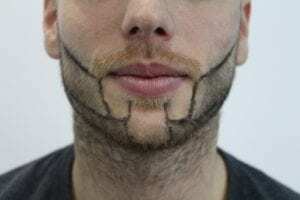 A beard transplant is just what its name suggests: hair taken from another part of the body is implanted into your face to create the beard style of your choosing. Hair transplants most often bring to mind the method used to address a receding hairline, but beard transplants have surged in popularity in recent years. Research by the International Society of Hair Restoration Surgery and others report that facial hair transplants are the third most popular type of hair transplant worldwide, behind only scalp and eyebrow hair transplants. An article published by the ISHRS said that men between the ages of 26 and 40 have particularly embraced beard transplant procedures. Why the rise in popularity? The reasons are numerous, including the desire of many men to achieve a (bearded) look that represents masculinity and virility. Other men feel that beards represent wisdom, or like the appearance of many bearded celebrities, such as Brad Pitt and George_Clooney. The beard has a prominent role in modern culture and for men who are unable to grow a full beard or achieve their desired facial hair look, a beard transplant represents a way to help them to achieve that look. The most effective ways to grow a beard are Minoxidil and beard implants. Also known as Rogaine, Minoxidil was initially used to treat high blood pressure. Many early users discovered an interesting side effect with Minoxidil: it caused hair growth. The Food & Drug Administration approved Minoxidil as a hair-growth product in 1988. While scientists still don't know the exact reason why Minoxidil causes hair growth, they know that it's a potassium channel opener the stimulates blood circulation in hair follicles. Better blood circulation means that more hormones and nutrient reach the hair's roots which, in turn, stimulates hair growth. Minoxidil also stimulates the enzyme prostaglandin synthase-1 via the immune system; scientists have speculated for years that there's a connection between hair loss and the immune system. Minoxidil is effective for many men who want to grow a fuller beard but it's not without some drawbacks. For one, it may cause an increased density of hair in other parts of the body. It may also cause dry skin and a lowered blood pressure (but should never be used as a substitute for blood pressure medicine prescribed by a doctor). Some users have complained of weight gain after they started using Minoxidil, but whether Minoxidil was the reason for their weight gain is open to debate. Another potential drawback of using Minoxidil to grow a beard is that it's recommended that you apply it twice daily – which is an inconvenience for many men. Let's delve deeper into beard transplants, which represent a more effective way to grow a beard or to attain a dense beard. The hair used for beard transplants comes from another part of the patient's head area, most often from under the chin. If there isn't a sufficient supply of hair under the chin, hair taken from the horseshoe-shaped fringe of the head is another option. The hair on the back of your head varies in its structure and diameter than pre-existing beard hair, making it harder to match it with your facial hair. To achieve a natural-looking beard density, surgeons may opt to use a high number of grafts to meet the patient's expectations. An average of 4,000 to 7,000 hair follicle grafts are available for use in a beard transplant procedure. It's important to note that hair removed from one area may shorten the final reserves of hair follicles available for future implants. Hair surgeons chose the area under the chin to extract hair for a variety of reasons, not the least of which is that it matches the density and diameter of facial hair that's visible to the public. If there's not enough hair under the chin, surgeons may use hair from the scalp or chest. Chest hair gives the beard area more density. A beard transplant involves a pretty straightforward process in which hair follicles are removed (from under the chin or back of the head) and then transplanted into bald patches in the beard area. The difference between a beard transplant and a hair transplant is that physicians make small incisions while transplanting hair to the scalp. Facial hair transplants aren't just for beards, either. Whether it's your mustache, sideburns, or goatee, transplants will help you achieve the look that you desire. 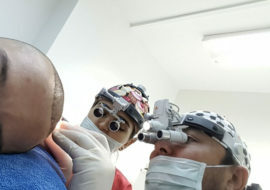 No, what type of procedure you choose, the surgeon must first evaluate the consistency of the hair in the recipient area with an area of the body that's a suitable donor site. The new facial hair grows like normal facial hair with similar texture and characteristics. You can shave the new hair as you would with any facial hair or let it grow to a length similar to the native hair follicle. Once transplanted, the new hairs are extremely difficult to tell apart from your natural facial hair. Follicular Unit Extraction (FUE) and Follicular Unit Transplantation (FUT) are the two major types of hair transplants, including beard transplants. Both refer to a technique by which surgeons remove hair from the donor area. In an FUE transplant procedure, each hair graft is removed one by one from the donor region and harvested through small circular incisions over a larger area, with small, barely-noticeable white scars left behind. In an FUE, the surgeon is typically able to harvest about one of every five follicles, although results vary depending on the physician and the quality of the procedure. Note: FUE is the most common method of beard transplants. In a FUT transplant, a small strip of tissue is removed from the donor area via a microscopic dissection process. The surgeon then closes the wound edges, leaving behind a single, fine scar. FUE doesn’t leave behind a linear scar as do FUT transplants. FUE has a faster healing time, meaning that patients who want to return to regular physical activity can do so relatively quickly. FUE is preferred for extracting hair from donor regions in which are more susceptible to widened scars due to skin looseness. 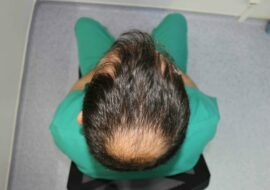 The tiny white scars left behind by the FUE procedure are difficult to see, even in areas of the fringe scalp regions where the hair is short. The scars may cover a wider area of the donor region than with FUT transplants but, again, they’re not as easy to detect. There is little or no discomfort with FUE. It’s also useful for patients at a higher risk for donor scarring. As mentioned, the beard transplant recovery time for FUE is faster than with a FUT procedure. That’s because the small holes use for hair extraction aren’t at risk of widening as the strip wounds caused by FUT. 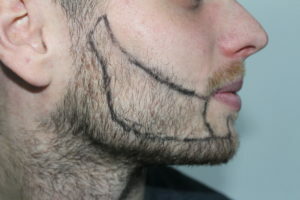 A FUT strip typically harvests a larger amount of hair from the donor region, making it easier to achieve maximum fullness for the beard transplant. In FUT, the donor strip is removed from the mid-portion of the harvest zone to obtain a sufficient number of grafts. The Foundation for Hair Restoration offers these instructions to patients about to have an FUE beard transplant procedure. The following video demonstrates the transplant procedure at Hair Clinic Ankara, as well as beard transplant before and after photos. Refrain from taking any medication that contains aspirin 10 days before your transplant. You may take Tylenol, however. Also, avoid vitamin E – and any multivitamins that contain vitamin, as well as gingko biloba. Don't take any anti-inflammatory medications three days before your procedure, or drink alcohol. Also avoid over-exposure to the sun. If you receive sedation during your procedure, arrange for someone to drive you home after. Your physician will determine what type of sedation he or she will use during the beard transplant. If hair is harvested from the back of your head, make sure that it's at least a half-inch in length so it covers the sutures. Refraining from smoking one week before and one week after the procedure improves the healing process. Taking vitamin C (1000 to 2000 mg) once a day for one week before your procedure also aids in the healing process. Don't drink coffee or other caffeinated beverages in the morning of the procedure as they may increase bleeding and sensitivity to medications. Take your routinely prescribed medications unless instructed otherwise. You may need to remove contact lenses before sedation. Let the physician's office know if you're allergic to any of the medications the physician prescribes to you. Some common post-operative medications include an antibiotic used to prevent infection for pain or discomfort in the donor area. You'll be given an antibiotic ointment to apply to the donor area twice a day for up to five days after the transplant. You can resume shaving from a week to 10 days after the procedure. The signs of having had the procedure usually subside within five to seven days. Most people only will notice your new hair growth and perhaps some mild flaking. Some patients report prolonged pinkness but taking Benadryl 25 mg twice a day treats this symptom. Tiny crusts will form at the site of each graft but fall off within four to six days. Gently rub them off after a week, unless doing so causes discomfort or bleeding. Don't get the transplanted areas wet – if possible – for the five days immediately following the procedure. After that, you're able to wash your face normally and you can resume your full exercise routine. The FUE procedure doesn't involve sutures, so you won't have to have them removed or let them dissolve on their own. You can expect numbness, tingling, and other sensations at the graft sites and on the donor area. This is common and normal and may last for several weeks before resolving itself on its own. The hair will grow just like normal beard hairs one they're transplanted. 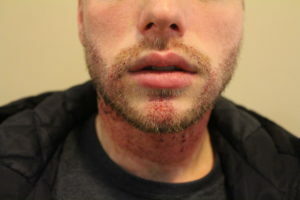 The good news is that beard transplant patients should notice improvements in side effects each day after the procedure. Swelling and redness should subside in a week. While you may want to gently rub the scabs and crusts off after a week, be very careful when doing so (or don't do it all). The crusts and scabs are natural parts of the healing process. Again, you should refrain from shaving for at least 10 days after your procedure. Why is My Donor Hair Falling Out? Don't be alarmed when your donor hair begins to fall out two to three weeks after surgery – it's a natural and temporary part of the process. The donor hair eventually grows back and helps to fill out your beard. 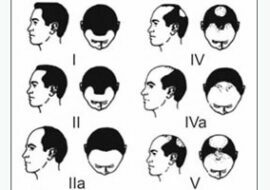 The same temporary hair loss occurs following a scalp hair transplant. Will My Transplant Involve Only One Procedure? Depending on the availability and adequacy of donor hair, a beard transplant often takes just one session. The typical procedure takes between two to five. Can I be a Beard Donor For Someone Else? The answer is no because it would be very difficult to find a perfect beard hair match from one person to another. The cost of a beard transplant at Hairline Clinic Ankara is 3 euros per graft. Patients can expect daily meals, medication, a post-transplant package, and more. Worldwide, the number one consideration for a beard transplant cost is how much hair is transplanted. Most clinics charge by the graft, while others charge per session. The advantage of the per-graft payment model is that you pay for exactly the number of grafts that are prepared and transplanted. It's considered fairer than per-session model because some patients require more grafts than others. Beard transplant costs vary widely throughout the world and location plays a prominent role in the final price, as well. Turkey, the location of Hairline Clinic Ankara, is the world leader in revenues generated from hair restoration. At the Hair Clinic Ankara, you'll have a high-quality beard transplant at a reasonable price. All of our extractions are performed manually by a physician, who believe that manual extraction provides better results than those performed by electronic devices. Moreover, the extreme extraction speed of devices may damage grafts and prevent them from growing as expected. The number of grafts per day will not exceed 1,500, and each graft is transplanted immediately. We save all grafts for future use. If you'd like to learn more about what the Hair Clinic Ankara offers, or to receive a consultation, call +41 76 569-4284.